Cartridge Save aim to save you money on every HP F4188 ink cartridge. In the long run your HP F4188 will consume all of your printer ink, and when it does you'll soon discover that brand new HP F4188 ink is often really expensive. But you don't have to fret about forking out the steep prices you'll discover on the main street because here at Cartridge Save you can purchase all the HP F 4188 cartridges you'll need at very competitive prices. Spend less cash on your ink by buying with Cartridge Save! It makes little sense paying more for the F-4188 original cartridge or F4188 compatible ink on the high street when it is much easier to save a load of cash ordering online with Cartridge Save. You have full satisfaction by purchasing your DeskJet F4188 ink cartridges from us as they are all covered by a hassle-free money back guarantee. Be mindful of the fact that each and every order has free delivery, mostly arriving with you the next working day! This printer is a good choice for users seeking a budget-friendly all-in-one device that has an integrated copier and scanner. Though the HP Deskjet F4188 is affordable, significantly faster, and user-friendly, it lacks out-of-warranty support and is prone to software errors. The HP Deskjet F4188 does not deviate from the design of the HP Deskjet F4100 line with its box-type appearance. Weighing less than 10 lbs., it remains compact even when the output tray is extended, making it suitable for small desktops or cabinets. This printer is also a little faster than its predecessors. The HP Deskjet F4188 is almost as fast as a laser printer because it can produce 14 ppm in colour and 20 ppm in monochrome. The scanning resolution is good at 1200x2400 dpi, and the copier produces excellent output. 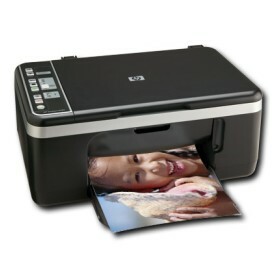 Users also reported liking the HP Deskjet F4188 because it is affordable to run. Consumables such as ink cartridges are widely available and inexpensive. The print quality in draft mode is superior, too. Like other printers from the F4100 line, the HP Deskjet F4188 has been discontinued, so you may have a difficult time getting out-of-warranty support for this device. The quality of photo prints is average (at best) and could use some improvement. Compatibility problems with Windows 7 operating system is always an issue. Some users report that their files go missing after using the HP Solution Center program to scan.